Solve a problem that is defined by an export from Optimization app. Define a problem in Optimization app. Enter optimtool('fzero'), and fill in the problem as pictured. The Optimization app warns that it will be removed in a future release. Select File > Export to Workspace, and export the problem as pictured to a variable named problem. Enter the following at the command line. To include extra parameters in your function, see the example Root of Function with Extra Parameter and the section Passing Extra Parameters. 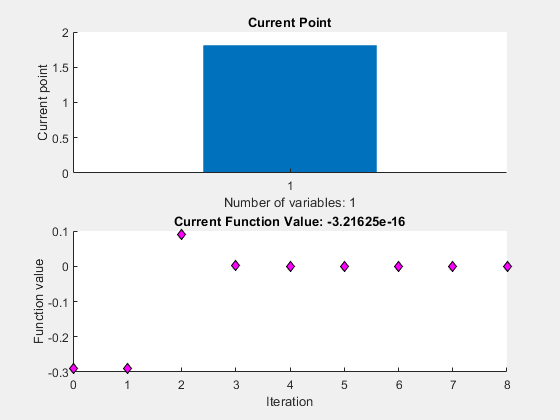 Specify one or more user-defined functions that an optimization function calls at each iteration, either as a function handle or as a cell array of function handles. The default is none (). See Output Function Syntax. Termination tolerance on x, a positive scalar. The default is eps, 2.2204e–16. See Tolerances and Stopping Criteria. You can generate problem by exporting from Optimization app. See Importing and Exporting Your Work or Solve Exported Problem.